OptIPuter All Hands Meeting, 2006NCMIR Persistent Collaboration Spaces Hardware installations assembled at each site. Unify SW at each site (Rocks Viz. 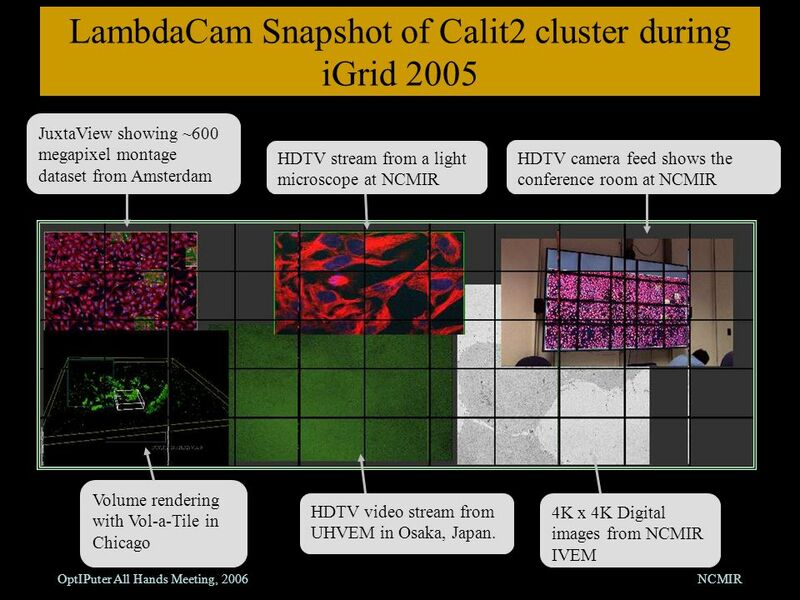 4 OptIPuter All Hands Meeting, 2006NCMIR LambdaCam Snapshot of Calit2 cluster during iGrid 2005 JuxtaView showing ~600 megapixel montage dataset from Amsterdam HDTV stream from a light microscope at NCMIR HDTV camera feed shows the conference room at NCMIR Volume rendering with Vol-a-Tile in Chicago 4K x 4K Digital images from NCMIR IVEM HDTV video stream from UHVEM in Osaka, Japan. 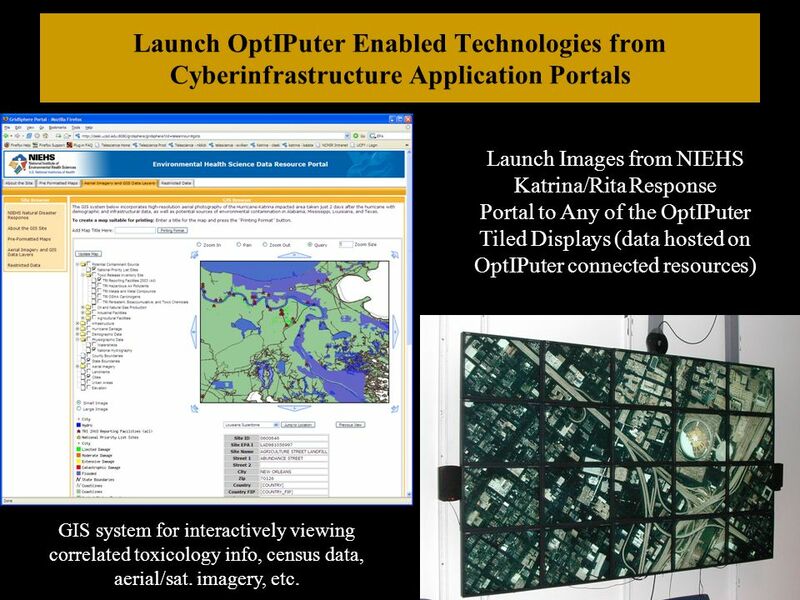 5 OptIPuter All Hands Meeting, 2006NCMIR Launch OptIPuter Enabled Technologies from Cyberinfrastructure Application Portals Launch Images from NIEHS Katrina/Rita Response Portal to Any of the OptIPuter Tiled Displays (data hosted on OptIPuter connected resources) GIS system for interactively viewing correlated toxicology info, census data, aerial/sat. imagery, etc. Download ppt "OptIPuter All Hands Meeting, 2006NCMIR Persistent Collaboration Spaces Hardware installations assembled at each site. 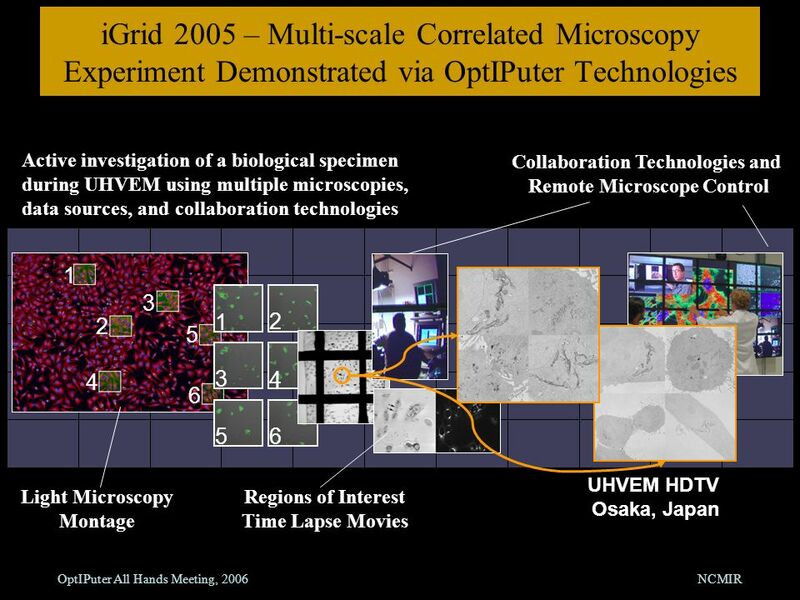 Unify SW at each site (Rocks Viz." Global Lambda Exchanges Dr. Thomas A. DeFanti Distinguished Professor of Computer Science, University of Illinois at Chicago Director, Electronic Visualization. Telescience Update Shinji Shimojo Fang-Pang Lin. Discussions 1. Environment: a. Common Test Platform: b. Common Architecture i. Middleware ii. Viz Wall. Kejun Dong, Yihua CNIC Elaine Liu, Jurgen UCSD CNIC Tiled Display Wall and Astronomical Data Visualization PRAGMA11 Workshop Oct.16/17. Telescience WG Shinji Shimojo Fang-pang Lin. Discussions (since PRAGMA 11) 1. Environment: a. Common Test Platform: b. Common Architecture i. Middleware. 2 set of 4x5 tiled display will soon be installed on Osaka Univ. campuses. –Hard ware NEC 19 inch LCD1990SXi (20 + 1) –Resolution 1280 x 1024 Sun Java. Kejun Dong, Kai Nan CNIC/CAS CNIC Resources And Activities Update Resources Working Group PRAGMA11 Workshop, Oct.16/17 Osaka, Japan. 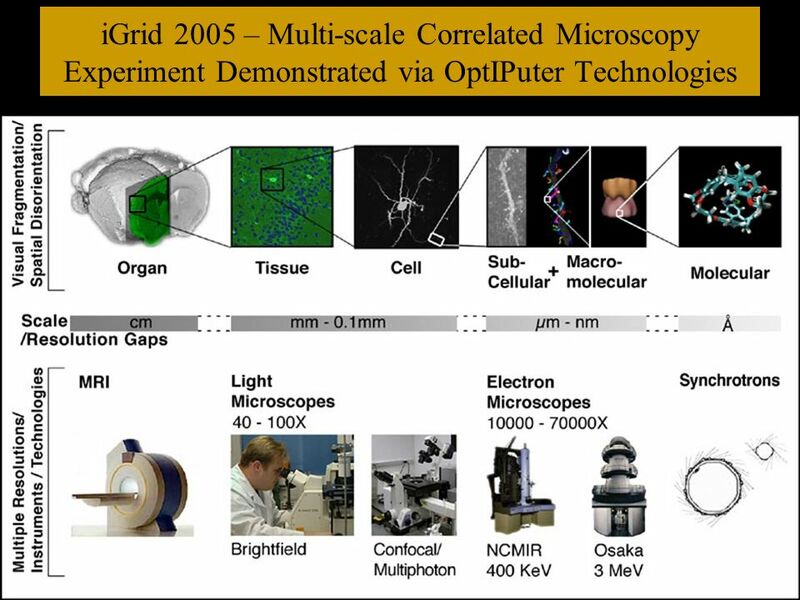 The Telescience Project - ATOMIC (Applications to Middleware Interaction Components) Transparent Grid Access for Scientific. JISC/BL Workshop Digital Libraries and their services March 6, 2006 Richard Boulderstone Director eStrategy, The British Library. InterPlay Live, Distributed, Surreal Cinema another language Jimmy Miklavcic Beth Miklavcic Another Language/University of Utah CHPC Performing on a High-Tech. James E. Madory, D.O. Assistant Professor Medical Director of Pathology Informatics Department of Pathology and Laboratory Medicine Medical University. Seminar on Video Conferencing Department of Computer science and Engineering VRSEC.